One question which I’ve received several times recently, is how to unlock funds in an Ontario locked-in retirement account such as a LIRA, LRIF. I did this for my Dad a couple of years ago and successfully unlocked his LIRA. Ironically, he never should have had a LIRA – it must have been an RRSP contribution that got set up in error at some point. There are a number of ways to unlock your Ontario locked-in retirement account. This includes LIRA and LRIFs which are basically locked-in RRSPs and RRIFs. Transfer the LIRA or LRIF to a LIF (Life Income Fund) account. This LIF account will be considered a “new” LIF account. You will have to instruct your financial institution to do this step. You are allowed a one-time 50% unlock from the LIF account. This means you can request for a transfer of half the account value to an RRSP or RRIF account or just withdraw the money from the LIF. This unlock has to be completed within 60 days of the creation of the new LIF account. Do not delay! When you complete the unlock, the money is treated as taxable income for that year. If you transfer to a RRSP, you will receive a contribution receipt which will offset the transfer amount. If you are at least 55 years old and the total value of all money held in every Ontario locked-in account you own is less than $19,320 (for applications signed in 2011), you can apply to withdraw or transfer all the money in your Ontario locked-in account. Use this form. If you are 55 years of age or older, you can get limited annual payments from a LIF account. Convert your LIRA or LRIF to a LIF account and then request the maximum payment allowed. This link shows the calculation of the maximum payments allowed per year. The formula is needlessly complicated and is probably irrelevant for most investors. Just ask for the max! You are allowed to unlock money if you qualify under one of the financial hardship rules, even if you are under 55 years of age. If you think you might qualify – fill out one of the Form 6 or Form 6.1 (for low income) and follow the instructions on the form. If successful, you will receive a letter from the government which you give to your financial institution to unlock the account. Withdrawal Based on Low Income – Your expected total income from all sources before taxes for the 12 months following the date you sign the Application is less than $32,200. Use Form 6.1. Note, you can also use Form 6 for low income as well. Withdrawal for a Debt Against Your Principal Residence – You need money to avoid legal action or eviction from your principal residence due to unpaid mortgage payments or property taxes. Withdrawal for First and Last Months Rent – You need money to pay first and last months? rent, to rent a place to live. Withdrawal for Medical Expenses – You, your spouse or a dependent need money to pay for medical expenses and/or dental expenses to treat an illness or physical disability that any of you have. Withdrawal for Renovations to Your Principal Residence – You, your spouse or a dependent needs money to pay expenses to renovate your current or future principal residence to accommodate an illness or physical disability that any of you has. Withdrawal for Renovations to a Dependent’s Principal Residence – You, your spouse or a dependent need money to pay expenses to renovate that dependent’s current or future principal residence to accommodate an illness or physical disability that the dependent has. If your life expectancy is two years or less and you have a signed statement from a doctor, you can apply to unlock your money. Use this form. If you are a non-resident of Canada and your departure from Canada took place at least 24 months ago, you can apply to withdraw all the money from your Ontario locked-in account. Use this form. How is the province of regulation determined? Regulation for locked-in retirement accounts is provincial, with the exception of some larger companies which are federally regulated. The province where the income was earned and pension contributions made is the province that will regulate the LIRA. The province where the investor currently lives is irrelevant. Please contact the plan administrator to verify the applicable province. Also – the financial institution where the LIRA or LRIF is being held, should know the province of regulation. Transferred the LIRA to a LIF account. Do a 50% unlock (actually he had to do two 25% unlocks, since the 50% unlock option was unavailable at the time). Transfer the unlocked 50% to his RRSP. Complete two annual allowable payments. These were fairly small – about 4% of the account value each, but they helped lower the account balance. Unlock the remaining funds by using the small account rule. LIRA stands for locked-in retirement account. This is basically an RRSP account that is locked-in and you can’t make any withdrawals until the age of 55. LRIF stands for locked-in retirement income fund. This is basically a RRIF account that is locked-in. A LIRA must be converted to a LRIF by the end of the year in which the account holder turns 71. How is a LIRA created? Leave their accumulated pension credits in the pension plan and collect a pro-rated pension at retirement age. If they are close to retirement age, option 2 is usually not available. Are withdrawals from a LIF or RRSP or RRIF taxable? Yes, they are. Any withdrawals from a LIF, RRSP or RRIF will be considered taxable income for that year. The financial institution will hold some tax back at the time of the withdrawal. Now this article is why I read PF blogs and specifically this site. Thanks Mike. I’m not entirely sure where my parents have their money but if it is stuck in LIRA or LRIF this will help immensely. Thanks for this! I’ve got a LIARA but never really understood what the rules were aside from not having access for ~30 years. Since mine is fairly small (though not under the government definition of small) I’ve used it as a fund to invest in higher risk securities since I’ve basically got no choice but to leave it til 55. Would anyone know if Nortel was provincially or federally regulated (for Ontario employees)? We have a LIRA from them and I would like to know how to access it when the time comes. Also, do you know if the rules still state that any balances in a LRIF must be turned into an annuity when the plan holder turns 80? Thanks! @Adam – Yes, the government’s definition of “small” is quite small indeed. @Marypat – I don’t know about Nortel, but I do know that you do not have to convert LRIFs to annuities at age 80. Timely for me as I turn 55 and have a LIRA. Thx. I have a LIRA, looking forward to taking the chains off it at 55. Wow. This article was over the top. I bet most people didn’t realize you could unlock a locked in account. I knew you could under some circumstances – but hadn’t realized that you could do so in such a variety of fashions. 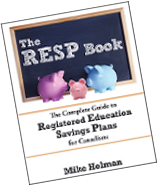 Mike, we also bought your RESP book. It was worth the money – simple, easy to read, and it paid for itself in the first hour I read it! Hi Mike…I worked for RBC back when it was called Royal Bank and left with a small pension ($1200 now worth $1500) back in 1998 which is in a LIRA. I worked the whole time in ON so my question is it governed by ON or Federal rules? Hi Paul. According to the book “The Pension Puzzle” which I just bought – all pensions for chartered bank employees are regulated by federal rules. It appears that the federal rules are pretty similar to the Ontario rules, so you should be able to unlock it when you turn 55. I should probably do a post on unlocking federal-regulated pensions – they are probably very common. Re: I want to give up my pension for that extra sweet space in my RRSP. They said no. I’m not surprised, especially if it is a defined benefit pension. The more members (and bigger the investment portfolio), the easier it is to keep costs in check and deliver the pension. There are only two situations where I’ve had flexibillity with a pension. The first was a company that allowed joining the db pension after the first year and before the start of the eleventh year (most companies requiring joining in the second year). The second is after quiting where the options were leaving the pension intact/capped or transferring to a LIRA/RRSP (LIRA for the employer plus a small part of my contributions with the remainder into an RRSP). The situation that was talked about with HR is different – where you are trying to quit th pension plan. I’m not aware of any employer or any plan that allows this for the employers contributions. Bear in mind that if the pension is a defined contribution pension – there may be other factors to want to change but RRSP contribution room is not affected. Then too – as my friend found out when he ran the numbers, being in a db pension can be much better in some situations. He was late into the db pension so when he assumed what he thought was a reasonable growth rate for his RRSP – his figures showed running out of RRSP money in 6.5 years, compared to the db pension that would run pay out to his spouse for 10 years, if he dropped dead the first month of retirement. My wife work for a company for 20 years and got let go because she hurt herself. She is on WSIB with payments of $1395 every two weeks. This went on for the last 2 years. About 2 mouths ago WSIB sent her a letter telling her that the money would be reduced to 768 every two weeks. this works out to $10.25 hr. Her total income for the year now will be around 18 000. When she was let go she had a pension plan that was put into a lock in RRSP worth around 42 000. would she be able to get some of this money out now that her income in under 32 000 and if yes how much do you think she could take. The WSIB payments are tax free will this really hurt her at tax time if she did get money out. I read with interest the article on unlocking a LIRA. One question: I am 60 yrs old and would like to convert my LIRA to an LIF prior to unlocking 50% of the fund. Must I be retired already in order to do this? I am 62 yrs old and currently have LIRA and RRSP. Can I use my LIRA and RRSP as mortgage to purchase an income property? My financial advisor at Meridian CU advised me that it would be difficult as the admin cost to manage my LIRA and RRSP mortgage would be very expensive. Please advise if I can use it as mortgage to purchase an income property? I have left Canada and understand I can apply to withdraw my Lira once i am a non resident of Canada after 24 months. I am experiencing financial difficulty and am unable to secure employment. I have withdrawn money from my LIRA under financial hardship in 2011 while still living in ontario and can apply again in march. do you know if i can still apply even though ive left the country? On what line of the Tax Return is the offsetting RRSP Contribution Receipt entered after the 50% unlocking of the RIF. what if my job is terminated? how much approx would my payout be after 21 yrs of service? If I leave Canada for two years to become a non-resident in order to unlock a LIRA then Revenue Canada will consider me to be an emigrant or a factual resident of Canada. If I am a factual resident of Canada then I am still a resident and cannot unlock my LIRA? Or do I have to become an emigrant in order to unlock my LIRA and lose my Canadian citizenship? Thank-you in advance for the advice. If the T4 for the LIF will not be received until 2013 (for the 2012 tax year). But, the RRSP contribution slip has been received in the 1st 60 days of 2012. Can I use the RRSP deduction against other 2011 income, a higher income year and then deal with paying the tax on the T4-LIF next year? OR do they HAVE to offet each other as a direct transfer? Thanks for your help! I’m a US citizen. I taught at an Ontario university for four years and have an RPP. I returned to the US in 2001, and I’m over 55. I currently have over $30,000 in my account and they’re charging me $400 a year to administer it. I’d rather have my funds in the US where I can combine it with my other retirement investments in my portfolio–can I bring my funds to the US, and how? If not, can I find a better Canadian fund to invest for my upcoming retirement days? Thanks for the great post. I appreciate this article as I have LIRA and i always wanted to know how you can unlock this account in simple words. Can you help me with this – I am nearly 38 yrs old in ON and have LIRA. How can I get my money UNLOCKED? I have locked in account at ING with amount nearly 27k. I just want to withdraw (if possible) as I have very long journey ahead. I do not want to leave it to bank or govt (you see all bailouts for rich)? More, from this article link – I have seen couple of changes in LIRA – which ING did not bother to inform me. These changes could have helped me, i think. I had a locked in rsp with great west life at the time of signing the recruiter forgot to mention it was a locked in rsp and can not be touched at all. When I left my employer who provided the rsp I switched it to the RBC bank again as locked in as after reading that you have 60 days to switch it to a regular RSP which the guy at the bank neglected to tell me too. I want to use this money to either pay bills or put as a down payment on a house. Aside from living from paycheque to paycheque I am not in financial hardship. Right now there is 13000.00 in the account which I would like to use now. Is there any way aside from dying early, or financial hardship that i can have this money released. My wife has a LIRA as a result of a divorce settlement from her first husband who worked for the federal government. Is her LIRA considered Federal or would it be Provincial (Ontario, Quebec?). I have an Ontario lira and am 57yrs and still working in BC.Apparently you can convert 50% to a rrsp and the other 50% to a lif withdraw the max allowable from lif and put into rsp if you have room. Annuitize?? some and claim the $2000 pension income credit.For easy figuring say there is $100k in the lira.What order do I do this in and how do you annuitize without actually buying an annuity from an insurance company. Thanx. So i’m leaving my current employer who has a federally governed defined benefit pension plan and since I’m going back to school (and therefore can’t transfer this pension anywhere), it’s going to be stuffed into an untoucheable Locked In Retirement Account. There are various ways to unlock these accounts but they all seem to require me to be over 55 (which will be awesome in 29 years) or be seriously po’ (“financial hardships” clauses). I’d like to take this money out and put it into a regular RRSP that I can then withdraw from under the Lifelong Learning Plan and help me pay tuition. Anyone have any ideas on unlocking this? This seems like a ridiculous issue given that it is the money that I put in there in the first place…. Hello everyone. First of all, excellent article. Well written and easy to follow. I was curious if anyone can help with a bit a special case. A Friend of mine moved back to Europe a few years ago (more than 24 months). He will be 55 in May 2013. He currently has less than $19K in a locked in RSP in Ontario and is trying to get the money out based on either his age or his non-resident status. The Plan holder says he need to transfer the RSP to a LIF before being able to cash it out. Is this true or can he apply while it is still in the RSP. I’m just worried a bank will not open a LIF or other for a non-resident. Any assitance is great appreciated! I have a Lira of Ontario Hydro Bonds I have been a non-resident for tax purposes since 1992 Can I withdraw my whole Lira anytime? I was terminated from my employer and I have to transfer my RPP to a LIRA. After it is transferred to the LIRA, can I transfer to a new LIF and withdraw up to 50% from the new LIF within 60 days (if I am under age 55)? i have a small LIRA that I was forced to open a number of years (1995) after my company closed down. This LIRA has not made me any money – it would have been better to have given us the money to put a downpayment on a house as that would have been a better investment. But I am now age 55 but not retired and was wondering if I can close my LIRA and take either the cash to invest where I want or transfer to an RRSP. Hi, my wife wanted to transfer her lira account from Ontario to bc. Her bank closed the lira account and transferred the money $7800 now we find that nearly $3000 has been withheld for taxes, is that right? Thank you. Is there anyway to have funds released from a WSIB LRI before the age of 65 due to financial hardship? Hi Mike -great information! Turns out as a pastor I advocate for the elderly but this one is a doozy. A dear 67 year old woman friend of mine has has worked for a major University in Ontario for 34 years(CUPE?). She wants to retire in a few months and is currently on sick leave until August 21 2014. She asked to dip into her pension(Commuted value last year $330,000) to the tune of around $100,000 – $150,000 to deal with some serious financial issues(she has a few judgements against her by a few canadian banks that will start a garnishee in mid June). She most likely will be evicted. Her Employer refused her twice but could not show her where in the pension plan document it stated that she could not withdraw her funds into a LIRA and then take it out. They are basically saying that she could have withdrawn at 65 but not now. We smell a rat what do you think? I have about 38k in LIRA. If my total personal income is 35k to 40k every year and I have a credit card and credit line with RBC for 37k and paying $400 in interest every month, can I withdraw the LIRA and pay off my debt and save $400 a month ??? I live in Ontario and no where near retirement age but I may file for financial hardship as I need to pay down staggering debt load. Would the locked-in RRSP be a better option for me if I want to withhold the amount and pay down obligation, just in case I quality for low income under financial hardship? I have just discovered your website…a great source of information that I am sure to continue to reference in the future! I am 49 years old. I have a LIRA from an employer I left back in 1998. I have no urgent need for the money until my husband retires in about 20 years, however, I would love to have these funds rolled into my RRSP. Question: When I turn 55 if I convert my LIRA to a LIF, and then use my 50% option to roll half the funds into my RRSP, do I need to have RRSP room available in order to keep the tax man away? Also, I always assume that any investment I can hold in an RRSP I can also hold in a LIRA. Is this correct? I’m finding this information difficult to obtain. I have approx 70K in a locked in retirement account and am over 100K in debt. I am 67 years old and would like to unlock these funds….what should I do? On what line on Tax Return is the offsetting RRSP Contribution Receipt entered after the 50% unlocking of LRIF? HI, I was wondering if I could access my lira account to pay my back income taxes owing. my yearly income is over $50,000, and my lira account is under $10,000. I moved my mother in with me as she is battling cancer since july,that along with the credit card debt that I have accumulated and all the other home expenses,I just dont see a fast solution. My understanding is that if you took advantage of a ‘one-time 50% unlock from the LIF account’ and roll the funds into an RRSP that it isn’t considered taxable income until you actually withdraw it from the RRSP. This is the first place I’ve read that the unlocked funds would be considered taxable income for the year in which you unlocked the funds. Is this a new rule? Great article, thank you. I have approx $150k in LIRA but life has changed and I no longer have the income of a few years ago. My husband and I are in our early 60’s, credit cards are too high and our old house needs repairs that we want to do before we sell. This is the best news I’ve had in years. I’m contacting my financial advisor today to get this going. I sure hope I can move the funds I need. First of all, my sincere congradulations for all the information you provided above ! It is exceptionally/extremely helpful for a great number of people ! And most of all, very easy to follow !!! My question is not directly related (since everything i read in the aricle is very understandable). Do you provide services of this kind, or are there offices that provide personal services of this kind? The reason i am asking is because i am a non-resident for many-many years and as such it would be much easier for me to be guided by someone who knows this stuff, when i visit Canada to arrange all the above for my LIRA account. Thank you very, very much. I currently have a LIRA and want to transfer to an LIF account in order to access 50% of the amount; however, the provider has mentioned that I can only transfer into a LIF if I was at least 55 yrs old. (I am 33 yrs old). Are there any other options for me on how to unlock my LIRA? I have a fairly significant LIRA which I will need to convert to a LIF next year. The LIF provisions allow for “unlocking” up to 50% of the LIF and depositing/transferring the unlocked funds to a RRIF. The reason to consider this is to remove the “maximum withdrawal” provisions which are inherent in the LIF, but not an RRIF. As I understand it, the 50% withdrawal is shown as income, but depositing to an RRIF offsets makes the transaction “tax neutral”. However, if this is indeed shown as income, would this not impact OAS Clawback calculations?